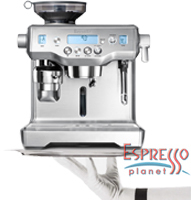 Synopsis: The long awaited Breville Oracle Dual Boiler Espresso Machine has arrived at Espresso Planet. When you purchase the Oracle, you become a member of the "Club Oracle" with access to priority technical support. It looks like Breville took the auto tamping technology from La Marzocco. The tamping pressure out of the box is close to 30 lbs. We confirmed this with a spring loaded tamper. The tamping pressure can be programmed. The distribution of the grinds accross the filter basked is amazingly even. The polishing can also be programmed. There is no way of channeling. A consistent tamp, every time, no matter who pulls a shot. The "Smart Steam Wand" is incredible. It features both modes. Either a manual steam wand or automatic steam wand with programmable milk temperature shut off and programmable milk to foam ratio. We were able to get a dense microfoam, perfect for latte art. No matter when steaming 8oz. or 16oz of milk, the results were consistent. Doesn't stop there, it even flushes out the steam wand with several steam bursts when done, sweet. We recommend to increase the steam boiler temperature to the maximum setting if you are mainly using the steam wand in manual mode for Micro Foaming. This way you get maximum rolling capacity. They even thought of the Americano drinker. There is a hot water spout directly behind the group head, dispensing hot water right into the mug after pulling a shot. With 3 preset and 6 custom settings there is plenty of Americano selections. The large bright LCD display enable easy reading, especially for us requiring reading glasses :) The brightness can be programmed. The Oracle even features LED illumination for the cup platform, perfect for pulling shots in the dark. The brightness can be programmed. The box comes loaded with extra Barista goodies such as knock box, double wall stainless steel travel mug, frothing pitcher, cleaning supplies and much more. Pay attention to the overall hight of the Oracle. To the top of the grinder hopper, the machine comes in at a hight of 18". Would you recommend the Oracle for a small Café? Max 100 /day on a busy day. How long is the wait time between each shot that can be pulled? No, we don't recommend the Oracle for commercial use. We consider 100 shots per day high volume commercial use and very demanding on your grinder, pump and steam boiler. Hi, can you tell me if i can make just regular coffee with the Oracle or just Americanos? It is a beautiful machine but is it also pretty easy to get the hang of / user friendly? The Oracle is perfect for Americanos and has several Americano settings. Use a lighter roast colour and grind a bit courser in order to brew regular coffee. Does this machine dispense hot water and can you use just the tamper if you use your own ground beans. Yes, it has a dedicated hot water spout for that purpose. Yes, the portfilter accepts standard 58mm tampers. Absolutely no problem to pull 10-20 espresso shots per day. Some Starbucks beans are very oily. Many grinders have problems with oily beans. You may experience "bridging" issues where the beans don't slide down the hopper. The grinder comes apart very easy for cleaning. We have not seen any issues with oily beans yet.